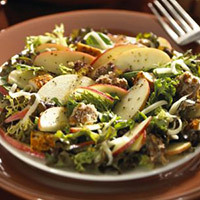 The perfect salad to take along for a picnic—chicken, cheese, and apples are tossed in a tangy vinaigrette dressing. Mix together all Apple Cider Vinaigrette ingredients (except oil) until sugar is dissolved, then add in oil and mix. Toss salad greens and apple cider vinaigrette together in bowl. Arrange diced chicken on top of greens. Sprinkle cheese to cover. Arrange apple slices in circular rows to cover. Sprinkle glazed walnuts to finish.